These days, people of all ages experience back pain. Caused by muscle tension, stress, improper diet, lack of exercise, poor posture, excess body weight, injuries, pregnancy, and a host of other triggers, pain in and around the spine makes everyday tasks very difficult. Back pain is usually accompanied by an inability to stand up straight, sit comfortably, bend down, or reach up high, and it reduces flexibility and motion, causing muscle aches and pain that radiates down the legs. There are plenty of over-the-counter pain medications available, but their effects are short-lived, and they can come with unwanted side effects. Why spend money on those when you could use safe, natural, everyday household items to reduce your back pain for good? Ready to find out how? Let’s get started! 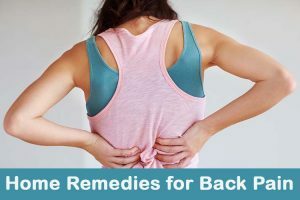 Follow these natural homemade remedies which help to get relief from back pain. Stress makes back more painful. Chamomile gives relief from stress by soothing the muscle tissues. Chamomile relaxes muscle tissue to reduce soreness. Boil a cup of water and stir in 1 teaspoon of dried chamomile. Let steep for 15 minutes. Strain and drink 3 times daily to get relief from stress. Note: if you’re allergic to chamomile, try store-bought chamomile tea bags. Ginger has anti-inflammatory property it reduces the pain caused by inflammation. It also relieves back pain caused by arthritis. Use ginger to spice your cooking, eat it raw, or follow the processes below. Boil 1 quart of water and stir in 1 teaspoon of peeled, minced ginger root. Reduce heat and simmer for 30 minutes by covering with lid. Let it cool for 30 minutes or room temperature. Drink regularly to reduce the pain. Apply ginger paste on the painful areas and leave on 5 minutes. Then apply eucalyptus oil. Or apply ginger oil by massaging it on the back pain area to get relief from the pain. Mix equal quantities of (half teaspoon) of cloves, black pepper corns and ginger powder. Stir in a cup of boiling water and steep for few minutes. Milk is rich in calcium and vitamin D, both of which make bones stronger and help prevent osteoporosis. Drink milk and consume other dairy products daily, green leafy vegetables, orange juice and vitamin D from the sunlight. Mix equal quantities of cuscus grass and sugar into a glass of warm milk. Garlic is naturally anti-inflammatory. Eat 2-3 raw cloves a day on empty stomach, use it to spice your cooking, and follow the process below. Fry 10 cloves of garlic in 2 teaspoons of coconut or sesame oil until they are brown. Strain out the cloves and store the oil in a container at room temperature. Rub the oil on your back and leave it on 3 hours. Holy basil reduces inflammation and relaxes tense back muscles to relieve soreness. Use basil to season your cooking, and follow the process below. Boil a cup of water and stir in 10 fresh basil leaves. Boil until your water reduces to half its original volume and becomes syrupy. Remove from heat and let it cool to reach room temperature. Add a pinch of salt and drink. Drink this tea twice a day to get rid of back pain. Epsom salt contains magnesium, sulfate, and enzymes that reduce inflammation and help the muscles and nervous system function properly, reducing pain triggered by tension and stress. Mix 2 cups of epsom salt into a hot bath. Soak for 30 minutes then take bath. Mix a tablespoon of epsom and hot water to make a paste. Soak a clean towel in the mixture and apply it to your back. Leave on until the towel is cool. Ice reduces inflammation and numbs pain. It ease the discomfort when you apply within 24 hours of an injury. Place ice cubes in a plastic bag and wrap them in a clean towel. Apply to back and leave on 20 minutes. Take off for 30 minutes, then apply for 30 more minutes. Keep alternating between on and off until you get complete relief from the back pain. Within the first 24 hours after an injury, ice is usually the most effective pain reliever. After 24 hours, use a hot compress to relax muscles and increase their elasticity. This prevents further injury and relieves pain. Soak a clean washcloth in hot water. Apply it to your back, and leave it on until it cools. Repeat several times a day to get relief. Or cook 1 cup of rice and put it in a sock. Apply the sock to your back until the rice cools. Once cool, microwave it to a comfortably hot temperature and re-apply. Hot baths relax muscles to reduce stress- and tension- induced soreness and increases the elasticity of muscles with its heating property. Soak in a hut water tub for 20 minutes. Note: Pregnant women should consult doctor before following this remedy. Physical therapy with a trained professional goes a long way to reducing and even curing back pain. Make sure you consult a doctor before getting physical therapy. Your therapist will help you during one-on-one sessions, and educate you so you can practice postures and exercises at home to keep your back healthy. Alternative treatments like acupuncture, massage therapy, cognitive-behavioral therapy, and others also relieve back pain. Your diet plays a major role in the health of your bones, nerves, and muscles, all of which contribute to the amount of back pain you experience throughout your life. Crush a teaspoon of poppy seeds and grind with rock sugar. Stir in 2 teaspoons of this mixture in a cup of warm milk. Drink twice in a day. Eat plenty of colorful fresh fruits and vegetables which helps to get the necessary vitamins, minerals and other essential things which help to give relieve from back pain..
Eat citrus fruits, eggplant, omega-3 fatty acids in your diet will help to ease the inflammation and prevent the back pain. Drink 8 glasses of water a day removes toxins from body and helps to better blood circulation and prevent the back pain. Eat whole grains and legumes. Eat plenty of yogurt, eggs, and lean meat to get protein. Don’t stay in bed too long. Lying down for long periods weakens muscles, making them more prone to injury. Prop your knees up with pillows while sleeping but don’t lie face down. Sleeping on sagging mattress will increase back pain. Invest in a good mattress that supports your entire back. Sleep with a pillow between your knees if you tend to sleep on your side. Get professional massages that involve natural oils like eucalyptus oil, almond oil, olive oil or coconut oil, etc. Try other remedies for back pain like turmeric tea. Use yoga, meditation, and breathing exercises to reduce stress. When sitting, make sure your lower back is well-supported. If you must sit for long periods, get up regularly and walk around in order to increase blood flow and flexibility. Try swimming laps, it tones and strengthens the back and abdominal muscles. When lifting, use your legs, not your back muscles, and keep the load close to your body. Quit smoking. The toxins in nicotine compromise the health of your spine. Follow these remedies and tips if you don’t get relief after a week or if you have chronic pain immediately consult a doctor. Have you tried any of these home remedies for back pain? Tell us which ones worked best for you!